Among the men killed in the First World War were more than a dozen vicars’ sons from Rutland. That’s nearly a quarter of all villages in the county where the son of their vicar or rector was amongst the Fallen. Arthur Taverner was the son of the vicar of Wing. 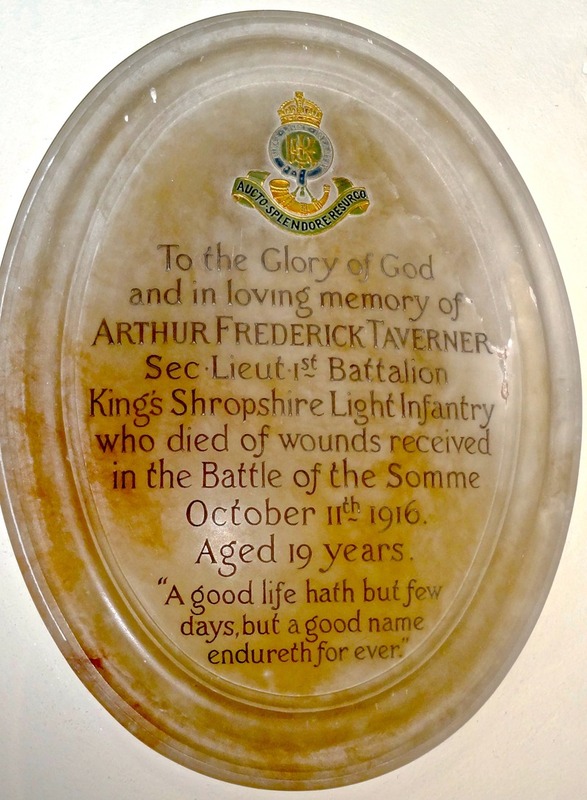 The Reverend Frederick Taverner moved to the village at the start of 1915, the same year his son enlisted. When Arthur was killed the following year Rev Taverner placed a memorial plaque to him right beside the pulpit at St Peter and St Paul church where it remains today. Rev Taverner stayed as the vicar there until the 1930s, sitting beside that plaque for every service he conducted. The Reverend C E Ellwood in Cottesmore was responsible for the village war memorial which is primarily dedicated to his son Geoffrey but also includes the names of other villagers who died. Geoffrey joined up as soon as the war broke out in August 1914, aged 22. He died two years later, one of eleven men killed from the village. All their names are on the war memorial, but Geoffrey has his own plaque taking up one side. Oakham School also saw a remarkably high proportion of vicars’ sons killed (12) – and the school chaplain, himself the son of a rector, lost his own brother in the First World War. The Reverend J H Jerwood taught and conducted services for many of those from the school who died and then in 1918 had the terrible grief of dealing with the death of his brother John Jerwood – himself an ex pupil who was killed on the first day of the big German Spring Offensive in March that year. John Jerwood was the holder of the Military Cross. Another vicar’s son to die was Humphrey Nevinson. He was born at the Rectory in Lyndon and lived there for the majority of his life. His father moved to become the vicar of Medbourne around the time Humphrey enlisted. There’s a plaque to him inside the church in Medbourne, yet he remains absent from the war memorial in Lyndon.